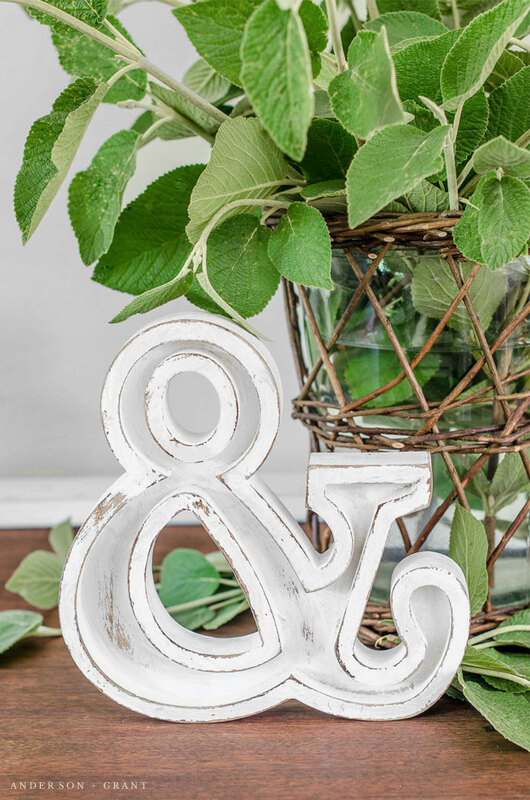 A basic craft store ampersand is given a farmhouse style makeover. Does anyone else find that their days slip away while the Olympics are on? Do you find yourself watching sports that you would normally have no interest in, and suddenly realizing water polo is the most fascinating sport you've ever seen? Please tell me that I'm not the only one who was lured into doing little or no work the past two weeks while they were on. Try as I might to sit down and type a post, Rio drew me back to a gold medal match. With the opportunity to watch arising only once every four years, I decided to go with it and fill my days with a little volleyball, gymnastics, and swimming. I'm trying to embrace a little more of life and the things I enjoy lately, rather than letting blogging and everything that it entails overfill my days. As the closing ceremonies were bringing an end to my excuse to avoid working last night, I began sorting through some pictures I had taken for inspiration of what I could post today. I realized that I had done a simple project awhile back but hadn't been shared here. Score! I've kind of gotten away from just sharing a quick "This is what I made" kind of project and that is something else I'm hoping to change. There are no fancy staged photographs and this post doesn't even show pictures of the steps I took. Not every post needs to be a time consuming and complicated DIY. 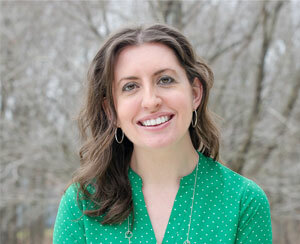 Once in awhile, it is fun to just pop in with something easy to inspire you to try something on your own. Awhile back, I picked up some MDF letters from Michael's when they were running their Alphabet Soup line on sale for 50% off. 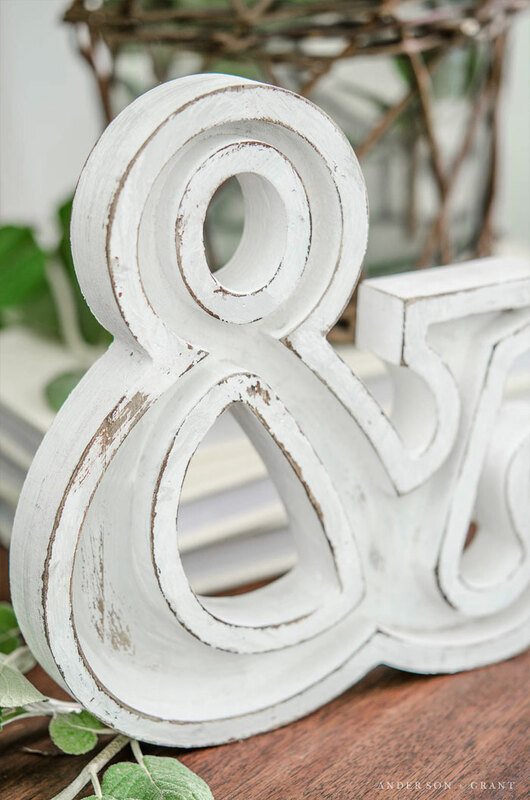 I loved that these ampersands that had a bit of real wood on the top and figured they would paint up nicely. They are a lot like my dough bowls.....I'm not sure why anyone would buy them as-is, but they become farmhouse perfect when given a little love. Then I stained the ampersand. Surprisingly, the MDF took stain well and created a lovely worn surface to show through the distressed paint. 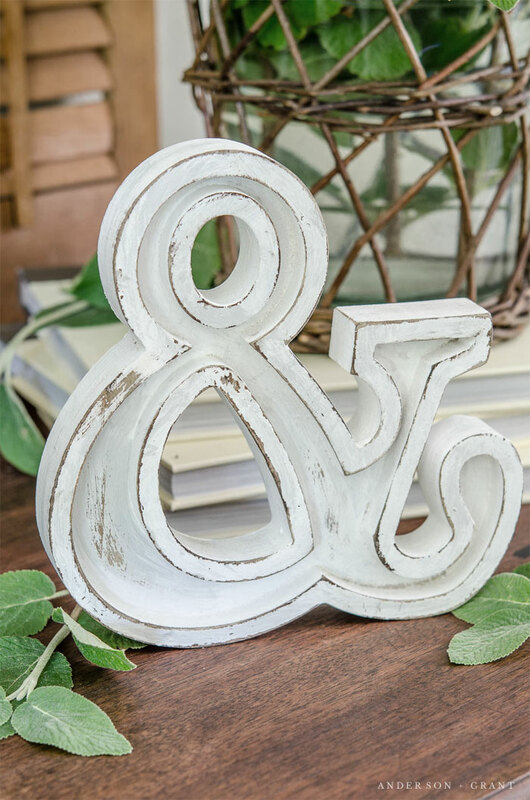 Then I painted the ampersand a clean white with two coats of Casement (from Fusion Mineral Paint). Dry brushing in areas with Lamp White (a very pale gray also from Fusion) provided a little more definition and interest to the letter. Then I gently sanded away areas where I had rubbed the wax creating a perfectly distressed piece of decor. 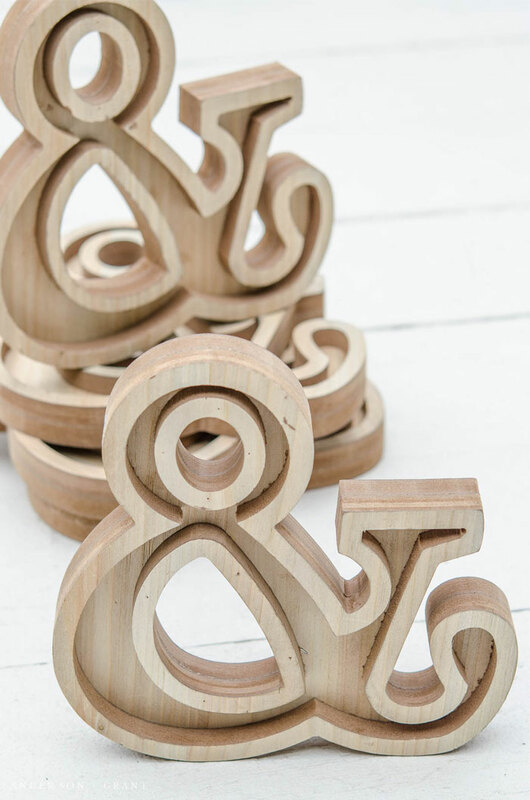 Sometimes craft stores fully embrace a trend (in this case, the wood letter trend) or specific style, but the cost inhibits people from buying it. 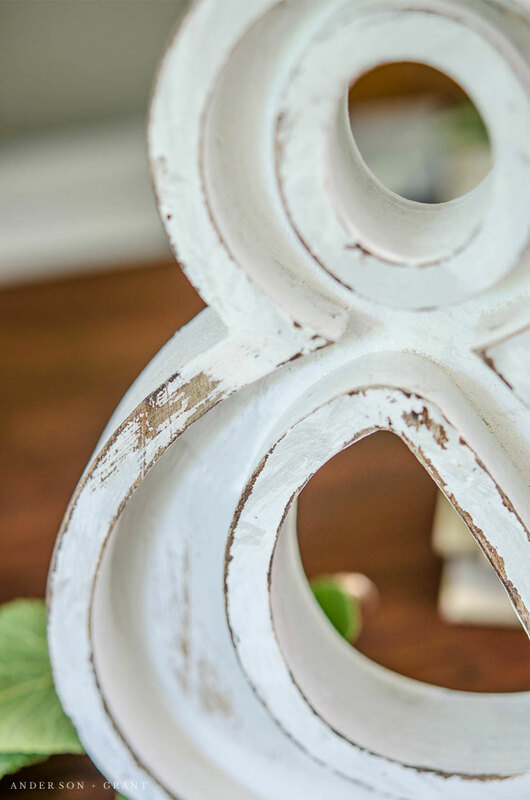 Often, you can later pick up some great pieces to transform for very little money. Although I don't get to Michael's often (I live 1 1/2 hours away from the nearest store), when I'm there I love looking through the sections selling items at 50% off or more. A lot of people cannot see the potential in what these finds can become so you can pick up some unique things to makeover. 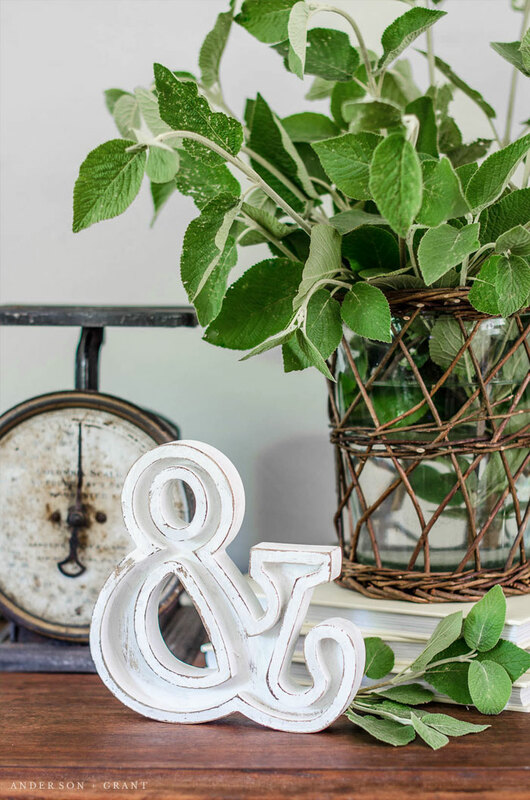 (One of my favorite examples of using these clearance items for creative decor is this one from Liz Marie Blog). Having a no-fail, quick project to do like this is so satisfying. There is nothing that could be done wrong as it is supposed to look worn and a bit haphazard. I love projects that I can do in an afternoon and feel good about. 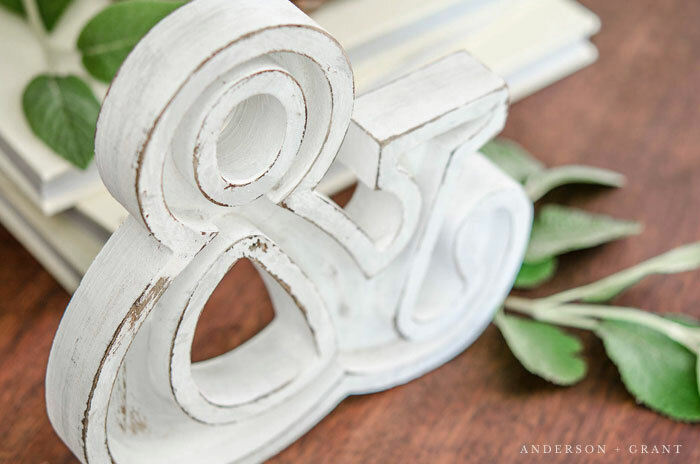 And as an added bonus, ampersands are such a hot trend at the moment and I was happy to be able to join in for less than $10!